This is the kiss of death for my ensuing participation in Gospel Doctrine. There are many beautiful passages in our scriptures. Some are long, most are short (I think that’s why they’re beautiful—articulate, succinct, with imagery that touches my heart in just a few phrases). There is never a reason to have people go around the room reading scriptures unless you’re trying to kill time. Have you ever heard the adage, “Show me, don’t tell me?” I think this applies doubly when it comes to using the stories in the scriptures for teaching. Telling (or reading) is much easier, but reading directly from the scriptures stifles discussion and assumes that your class is well-versed in reading and understanding Elizabethan English. I’ve come to rely on a few tools over the years that help me show what I see in scripture stories. In the spirit of showing, I’m going to take a passage that has been really difficult for me to teach, 2 Nephi 12-24. I won’t be providing an entire exegesis or interpretation here but I’ll walk through the tools I would use if I was preparing to teach on it. 1. Read different versions of the passage. 2. Read different translations/versions of the passage. As much as I love the King James Version of the Bible (KJV), sometimes, I read a story, and I think, “Whaaaa?” (I’m talking about you, Noah, like in 3 different stories.) So, I like to have a couple different versions of the Bible at hand. If you’re going to buy one Bible in addition to your KJV, I would recommend The Oxford Edition of the New Revised Standard Version (NRSV). I love the footnotes, I love the language. Between this version and the KJV, I feel pretty confident retelling any story in a talk or classroom. When dealing with the Old Testament, I’m also partial to the Tanakh: a New Translation of the Holy Scriptures. 3. Look at others’ lesson plans and scholarly works. After reading these different versions, taking notes, and praying (did I mention that? ), I have a good idea on my thoughts, and I move to the next step…seeing what others have done here. Feast Upon the Word: These bloggers do great work on lesson plans. Oftentimes, you can find at least two different bloggers’ lesson plans and ideas. I’m a big fan of Joe Spencer’s outlines (see his 2 Nephi plan here). Mormon Sunday School: Ditto for this website. Jared Anderson does a great job of really teasing out the theological points in each story with great citations and class members on this podcast. Anything with lds.org or byu.edu in the URL is trustworthy. I have had particularly good luck with BYU Studies and the Neal A Maxwell Institute (Sidney B Sperry’s “The Isaiah Quotation: 2 Nephi 12-24” is pretty much all you’d need to really hit the ball out of the park while preparing to speak about this section). Using these tools helps me to form my own opinions on these people in the scriptures, to see their flaws and compare them to my own, and makes them more vibrant and applicable in my daily life. The Book of Mormon didn’t really come alive for me until we were talking about what we learned in church during lunch one Sunday. My dad said, “Nephi is such a jerk when he talks about being a big, buff guy.” EXACTLY! I had thought this for years (in full disclosure: my dad and I are oldest children—is there an oldest child that thinks Nephi is super awesome?). Show your audience how these people in the scriptures are real, warts and all. It will make your retelling of the story in class more interesting and give the class more to discuss. Perhaps you’ve noticed, most of the scriptural interpretation work listed above is done by men and most of the stories we’re telling here are men’s. Blair Hodges wrote an excellent guest post on this problem. Hopefully, you’ll be inspired to write something for Exponent II’s Women’s Theology section or the Neal A Maxwell Institute’s three academic journals. We wouldn’t be doing our job here at The Exponent if we didn’t expound on some ways to insert women’s stories into lessons. It makes me so hopping mad whenever someone glosses over Miriam or Mary (any Mary!) in Gospel Doctrine or uses a story about a man in the scriptures when there’s a perfectly good example of a story with a woman that they may not know about. With a little extra work, this can be easily remedied. This book lists every woman (named and unnamed) in the Bible and talks about them. I believe the index covers some theological themes like faith, courage, etc. 2. 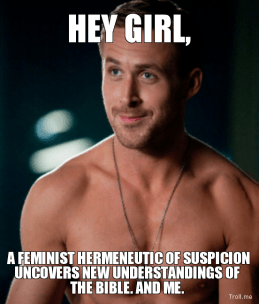 Once you find the woman that speaks to you and the lesson you’re working on teaching, write your own interpretation: Caroline wrote an excellent post on hermeneutics (finding meaning in scripture), and Bob Rees wrote about midrash (telling a story from scripture with your own interpretive spin). We do both of these every time we teach the scriptures. We share the story (remember, we’re note reading it anymore!) and then, we interpret what it means to us. As Mormons, this is built into our lessons and the formulas we use for talks, but I think when we use words like “hermeneutics” and “midrash,” some can be intimidated. 3. Feeling stuck? Check out Mormon feminist blogs: Use the search bar on The Exponent, Feminist Mormon Housewives, or Zelophehad’s Daughters (also, I’m not as up on my MoFem blogs anymore…what did I miss? Please list in the comments below) using the name of a woman in the scriptures, you’re likely to come up with something. See how someone else told the story…how does it add to your understanding? Then, write it and publish it on one of the blogs or with a published journal or magazine. 4. If you’re really going for the gold star, look at the feminist research at prominent academic institutions like Claremont School of Theology and Harvard Divinity School. Look to authors like Carol L. Meyers and Elaine Pagels for feminist theological interpretations that will keep you well-fed intellectually and spiritually. How do you use the scriptures effectively in preparing for talks or class? What resources do you find helpful? Relief Society Lesson 2: Tragedy or Destiny? This is so helpful, Emily. I have heard people recommend looking at standard English translations for clarity, but with so many out there, I didn’t know which were good. Thanks for the help. I have been guilty of asking the class to read a long scripture story, a few verses at a time. You make a great case for why telling the story like a story is more engaging. One of the things we sometimes forget is that we can stop mid-verse to describe or explain in our own words, and then skip a few verses and pick up where we left off. I love using the KJV for the richly descriptive language, but if it’s just narrative or filler for the story, I can depart from that by saying in my own words. That’s been an effective way for me to get through long passages. Absolutely no need to read a huge chunk word for word and then try to dissect it afterward. I’m totally with you on that! So so good, Emily! I’m going to send a link of this post on to a our first counselor in RS. I live this, Emily! Thank you! I love this list of resources, and love the suggestions of alternative bibles. I’ve read other versions of the bible before, but never thought to use them in class. Thank you so much for this post- I’m keeping it at hand the next time I am assigned to teach scripture! Even though I have not had a teaching calling in more than a decade, I have wondered about sources to use to expand my understanding and interpretation of the scriptures. Thank you so much. This is very helpful. Super excellent post! I’m bookmarking this for next time I’m teaching, talking, or writing. This post is an incredible resource and something I’m sorely in need of. Thank you, EmilyCC! The Exponent is the first place I turn to online for RS lesson help–I can’t overstate how helpful they are and how much I appreciate the help it gives me in bringing women’s voices (and thoughtful insights/questions) to my RS lessons. Here’s another helpful site: https://gcsisters.wordpress.com that organizes women’s quotes from General Conference in alphabetical order by subject. Also, the two books in the “Girls Who Choose God” series are great help for bringing women in the scriptures alive.